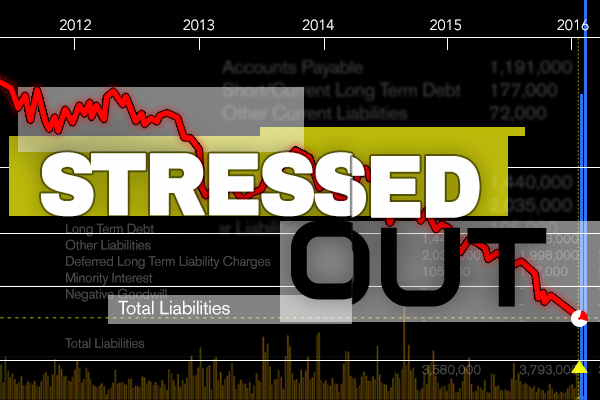 As Wall Street gets off to a historically bad start in 2016, TheStreet's Real Money is unveiling its “Stressed Out” index of 20 troubled stocks that you should be adding to your distressed watch list. These companies carry unsustainable debt loads and have a history of burning cash and resources in the absence of steady cash flow. They range across sectors -- retail, oil and gas, basic materials, telecoms and more -- and the Real Money team will be providing deep-dive analysis of the debt and equity problems sending shares to record low levels. In addition to providing continuing coverage of our initial 20 "Stressed Out" companies, Real Money will actively add newcomers and remove existing targets as managements prove successful in executing turnarounds. Is Bankruptcy the Best Place for Ultra Petroleum? Avon Products Regains Footing, But Is It Ready For Recovery? Will Encana Have to Issue Equity This Year? Will the Real Avon Please Stand Up? What Should Freeport-McMoRan Put on the Auction Block? Can Tidewater Sustain Today's Spike? Will Navient Cause the Student Debt Bubble to Pop? Is Avon Using Vanishing Cream on Its Cash?